Dynamic new ad generates twice the normal response and crushes once-successful “control”. 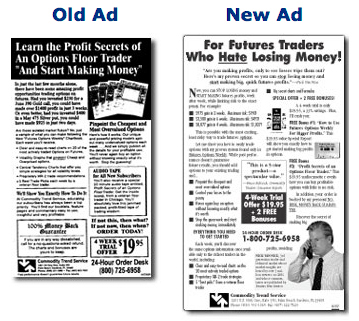 Commodity Trend Service launched a brand-new publication, Futures Options Weekly, with a display ad created by a freelance copywriter. While results were initially encouraging, the ad began to lose steam. To justify the costs of the ad and the expense of launching the new publication, Commodity Trend Service needed a significant lift in response. The promise of big, quick profits were highlighted, with specific examples, including the total risk. All the benefits of this special new publication were clearly listed. The offer was made more enticing by two Free Bonuses, instead of one. Editor Nick Van Nice was featured to add personality to the ad. “The new space ad just created has doubled our normal pull. It’s amazing what you guys can do with format and copy. Call or contact Creative Direct Marketing Group NOW and ask how CDMG can help you increase your response and your profits. There is no cost or obligation for your first consultation.